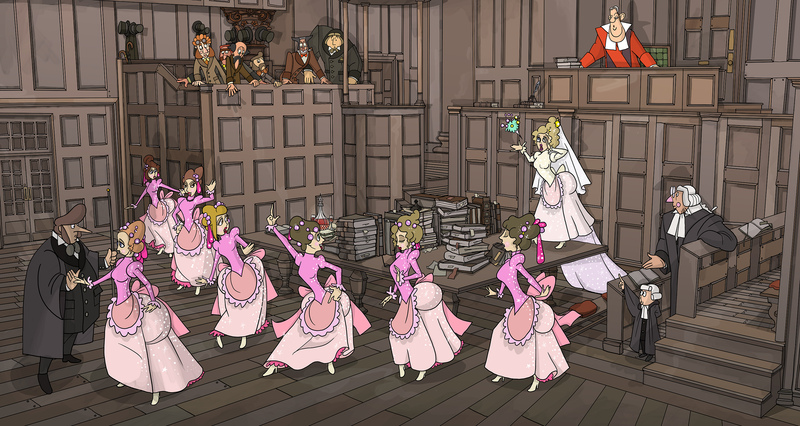 Here are a few screenshots of a sketch of the Bridesmaids’ chorus from TRIAL BY JURY. While John Hollingshead’s “Thespis” was the first piece that Gilbert worked on with Arthur Sullivan, “Trial by Jury” remains the first in the existing canon of 14 G&S operettas, written three years after Thespis and staged at the Royalty theatre. At 35 minutes, and originally penned by Gilbert to be set by Carl Rosa (the essence of the piece can be found in a ballad published in “Fun” even earlier), it was composed to open on 25th March 1875 as a companion piece to Offenbach’s Peruvian romance, “La Perichole” and Charles Collette’s farce “Cryptoconchoidsyphonostomata” (when you can get it/while it’s to be had); so, even at the beginning, it was already up against stiff competition. However, I realise that it is only in the context of Offenbach’s piece that one of the more peculiar bits of staging begins to make proper sense; for, in the final bars, Gilbert conceived of a tableau involving a transformation and plaster cherubim descending over the courtroom, the sort of whimsy that might make sense in an Offenbach piece and that is at odds with Gilbert’s stated belief in realism. Whimsical and foolish if seen alone, then, but a rather nice gesture to the French piece that it followed. There is more: the first Bridesmaid played the main part in the Collete piece, so again perhaps explaining why the nebulous first bridesmaid attracts any attention at all in the score of “Trial by Jury” as it stands! As for the orchestrations- maybe again dictated by what was to follow, as Sullivan highlights the oboe again and again- indeed, it was an oboist who pointed out the importance of the woodwind in Mozart and I have never forgotten the lesson. It pays off here too. Neil Farrow- Thankyou! I think the section “that she is reeling is plain to see”, by the way, is in fact a joke about Offenbach settings. Listen to it! But Sullivan is playing around with what is expected here, fortissimo crashing in quite unexpectedly and it underscores perfectly the heightened reality that Gilbert intended. What happens when people sing as they do throughout this piece is that their real emotions and their real characters emerge throughout. The defendant is a cad from beginning to end and we all know him well enough in real life. I can personally name a number of people who behave exactly like Edwin. He cannot disguise what he is, but equally, Sullivan gives him some of the best songs to make sure we can equally not ignore the effortless charm that wins him so much favour. In the end, after all, let’s not forget, he gets away with it! The defendant is the harlequin character that Gilbert had invented a few years’ earlier in “A Consistent Pantomime”, who committed crimes in mirth and then had to answer for them in the dock. It was then that he described the jury as “twelve men picked from the most ignorant, narrow minded, opinionated, intolerant and dishonest class of civilised beings in London”. It is also in this piece that he imagines the judge and defendant swapping places, each as awful as the other. 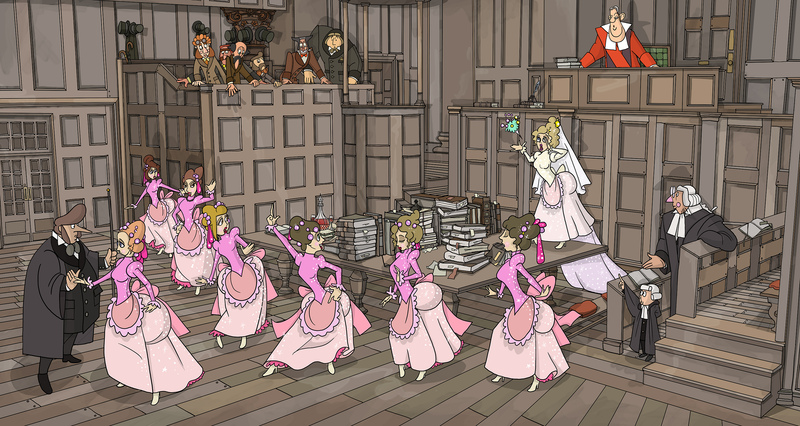 In the play, Harlequin places placards around the court accusing the judge and the jury of bribery and corruption. We are clearly in the same universe. I am not fully convinced about the harlequinade at the end of Gilbert’s initial staging of “Trial by Jury”, although I agree it may have been a subconscious attempt to draw parallels between the two productions, and I would be tempted to see the defendant, in my production, as a commedia character and to find some harlequin reference in his costuming however taxing that may be to animate. The judge may be a likeable old rogue, but so is the defendant. Both are colourful which alone more than justifies any move away from putting the Judge in Black robes. There are various editions of the score, many like the Schirmer, with little errors, some like the Broude rather better. However, there seem to be a number of interesting musical oddities –some indeed that seem never to feature fully in the routine recordings. For instance, in the opening sequence, (the sextet may be after Bellini- a vague quote from La Sonnambula- but the whole owes more to Donizetti) the chorus sing the word “Tried”, yet there are three differing versions of that word, 1) one with a dotted crochet, 2) one with a crochet and 3) then a minim. In the recordings I have found, these all seem to be about the same length but Sullivan clearly intended a difference to be heard and I assume a reason for that. Similarly, there is an odd moment in the same opening chorus when the sopranos and mezzos swap notes. Again, the effect is minimal in recordings, but it would be very nice in an animated version where the visuals lead the sound, and certainly comment on the sound, to see some justification of what Sullivan is already doing musically. The Usher enters to a strut. It is clearly in the music and is a routine piece of animation – indeed, once the basic walk is mastered, the strut and the sneak are the next exercise and I have certainly taught them in that order. (I am not sure all my videos have survived the cull from MPGU online videos, but if not I will do a summary on youtube shortly and post here!) The same pomposity suggests a joke after “Never never never since I joined the human race”, though it is more subtle. The first Defendant aria is fairly straightforward (but after the first revival, he lost his prop guitar completely although he still played “air-guitar” in the refrain) but the second “Oh Gentlemen listen” was an afterthought by Sullivan. Not enough is said of Angelina who seems to be a golddigger. She does not want to marry Edwin but to get substantial damages from him. The hearing was at the court of the exchequer which was closed in 1873, so whether that court ever heard anything other than revenue cases is a moot point. By the time the piece was performed, it was all old history anyway! One of the biggest shake-ups of the British legal system had just taken place in 1875. It is the same year that Bazalgette started the london sewerage system. To add to the nonsense, it is likely that a real breach of promise would not have been a Jury case anyway. Oh- and the reference to the trousseau is an attempt to keep the Jury’s mind on the costs that Edwin must cough up. Incidentally, the tradition of dressing the Judge in Purple (ordinary) or in Black comes from the new legislation so putting the Judge in scarlet might well be “justified”, although the early performance history has him in Black. I rather like this joke from Utopia Ltd: “Whether you’re an honest man or whether you’re a thief / Depends on whose solicitor has given me my brief” It chimes in with the idea that the Judge got his briefs by buying them when he was working as a barrister. Certainly there was some underhand activity. Our judge might just be carrying around legal papers to make himself look good. He is all glitter this Judge- a swallow-tail coat, a ring that looked like a ruby and a brief that somehow got him into a crown court. The Handel parody of the Judge’s entrance , I think, needs all the religious imagery that it can muster to make the point. Musically, I have yet to hear a recorded version that gets the full humour of the fortissimo revival of “He’ll tell us how” that follows the diminuendo. It should be so musically funny that the imposed cod interjections both here and “tried vainly to disparage” before “And now if you please…” by the judge become unnecessary. I hate these ad libs anyway! I also, incidentally, hate all the nonsense that has crept in around the echo effect that brings in Angelina. If it works at all, it should be a visual that travels down the corridors of the courts of justice exactly like an echo. The “Nice dilemma” is really an early 19th Century end of act chorus and it needs to feel like that maybe even pushing the visuals back earlier even to the court of Louis’ Versailles! One feature marks out “Trial” from the rest of the G&S canon is the absolute absence of bitterness and misogyny which creeps into almost every piece thereafter. Trial is a very optimistic work. It might be lampooning corruption but it retains a hopefulness that even “the Mikado” fails fully to sustain. There is, for example, in “Trial by Jury”, no middle aged Katisha to lampoon, no Ruth to mock, though admittedly the bride Angelina has a waywardness that anticipates that of Rose Maybud and starts a theme that marriage is some sort of lottery that later operas certainly develop (“I’ve no preference whatever.. Listen to him: well I never.”) The other thing that marks Trial is the way the chorus change their opinion to support whoever happens to be speaking at the time. this is the first time we hear this Gilbertian trick- This was something that Nick Jenkins pointed out to me about G&S in general but in fact given the legal setting it has even much more significance here. It is senseless and funny- it is this mindless decision-making surely that lies at the heart of the piece. It is high time “Trial by Jury” was translated and performed in other languages and I would like to see our planned animated version broadcast in a variety of tongues from the start. Any offers? Legal corruption is by no means a wholly British issue. They threw it self-raising and yeast!